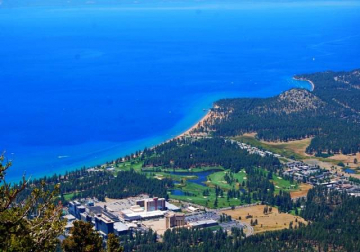 Stateline NV real estate encompasses a broad area on the Nevada side of the California/Nevada border on the South shore of beautiful Lake Tahoe. You’ll find that inventory of available homes on the Nevada side is typically much less than what is available on the California side. Many people prefer the Nevada side because of the tax breaks and benefits of residing in Nevada, in addition to the fact that the snow during the winter tends to melt off a lot more quickly on this side of the Lake and have longer sun exposure and beautiful sunsets all year round. Stateline neighborhood, close to the casinos and nightlife is mixed between single family and multi-family homes. It’s a great location for those who want to be near the action of the Stateline casinos and close to the beaches. Kingsbury Grade: Also falls within the town of Stateline, NV. This area can be broken into lower, middle and upper Kingsbury, each with it’s own unique attributes. Many of the homes on Kingsbury Grade feature lake views or larger estates can be found tucked in the edge of neighborhoods with miles of forest service land around you. Or up top near the Heavenly Stagecoach lodge, condo associations abound, many with affordable price points allowing for low maintenance condos and lake or valley views. Lake Village: A very popular condo community with great amenities on the edge of the Stateline community on the way to Round Hill. Located off of Highway 50 across from the meadow, this HOA has great features such as a year round spa/sauna and indoor game room area, tennis courts and outdoor pool during the summer months and trails abound around the community where you can walk for miles or down to nearby Nevada State beach. Click the links below to view available Stateline NV real estate for sale and do not hesitate to ask us if you would prefer a detailed list designed custom to fit your individual real estate needs.